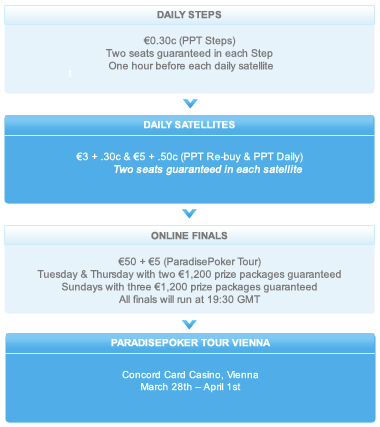 The next leg of the Paradise Poker Tour is to be held in Vienna, Austria from March 28th – April 1st, with a €125,000 guaranteed main event. Hosted in the glamorous Concord Card Casino, the Vienna event will feature a full range of side events, 24 hour cash game action and a Paradise Poker VIP party for qualifiers. There’s also a planned live satellite to PPT Greece, the final stop of Season 3.